Home / Columnists/ Dilemma in monetary policy: Monetary Board being caught in ‘The Devil’s Alternative’? Dilemma in monetary policy: Monetary Board being caught in ‘The Devil’s Alternative’? When the Monetary Board of the Central Bank was due to announce its monetary policy decision in March 2016, the market had expected it to tighten the policy by increasing interest rates (available at: http://www.ft.lk/article/533621/CB-expected-to-hike-key-policy-rates). The market’s predictions had been based on the logical economic choice which the Board would have made to lift the economy out of the prevailing foreign exchange crisis. But the policy review statement announced (available at: http://www.cbsl.gov.lk/pics_n_docs/latest_news/press_20160329eb.pdf) had proven the market wrong. Instead of tightening the monetary policy, it had announced the Board’s choice to maintain the status quo. Thus, the prevailing loose monetary policy with low interest rates, despite the high money and credit growth, was to be continued by the Board for another month. It would be reviewed only when the Board would meet in April to discuss what it would do with monetary policy again. The most important function which the Monetary Board conducts in the country is the management of the country’s monetary policy. The architect of the Central Bank and its founder Governor, John Exter, articulated this function in his report on the establishment of a central bank in Ceylon, known as the Exter Report, as follows: “The overall responsibility for the management, operations and administration of the Central Bank will rest with a Monetary Board. The word ‘monetary’ in its name emphasises again that the Board is intended to be very much more than simply the board of directors of another bank. It is a Governmental agency responsible for the determination of a particular kind of policy and the regulation of a particular kind of economic activity – money, banking and credit,” (p 11). Monetary policy is conducted by the Monetary Board to preserve the value of the Sri Lanka rupee for domestic as well as international transactions. Preserving the value of the rupee in the domestic market involves maintaining stable domestic prices or an ‘inflation-free world’. Its counterpart relating to international transactions requires the Board to stabilise the value of the rupee against other currencies, known as the exchange rate. But both these goals are just two links in the same chain leading from one to the other. Accordingly, if the Monetary Board messes up the monetary policy, it invariably causes problems for the exchange rate as well. 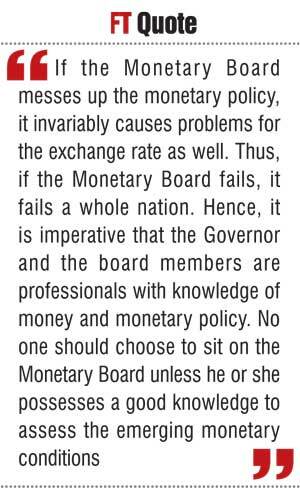 Thus, if the Monetary Board fails, it fails a whole nation. Hence, it is imperative that the Governor and the board members are professionals with knowledge of money and monetary policy. No one should choose to sit on the Monetary Board unless he or she possesses a good knowledge to assess the emerging monetary conditions. This is also one of the prime factors which the appointing authority, the President, should take into account when selecting people for appointment to the Monetary Board. The monetary policy review of March 2016, issued on behalf of the Monetary Board, is a confusing statement that does not stand with any economic logic. The review is like a ‘pre-obituary notice’ heralding the continuing deterioration of all macroeconomic indicators. Accordingly, growth has decelerated, core inflation has increased, the external sector has worsened and money and credit have ballooned. On the growth front, the services sector which had brought economic growth to the country in previous years had not performed well in 2015. Agriculture and industry too have brought dismal results. The Monetary Board had admitted that even the low growth of 4.8% in 2015 had been brought basically by an increase in the local consumption demand. The investment activities have decelerated, according to the Board, while exports have fallen – factors that have contracted the demand for the output. Though the Board had not prognosticated, if this situation prevails, the growth in 2016 will also be a dismal. On the price side, the Board had admitted that the inflation rate that matters to the Board, namely, the core inflation rate, has increased from 4.6% in January 2016 to 5.7% in February. What is published by the Department of Census and Statistics as the Colombo Consumers’ Price Index or the National Consumers’ Price Index is called the ‘headline inflation’ consisting of prices of all goods and services used for computing the indices. Some of these prices are subject to changes in seasonal supply situations like those of food items or administratively determined like fuel and energy prices. They do not, therefore, respond to the Central Bank’s monetary policy. Hence, a separate inflation rate is calculated by excluding those prices from CCPI, called core inflation, for guidance of the Monetary Board. The Board tightens or loosens monetary policy not in accordance with the headline inflation but in accordance with the changes in the core inflation. The current acceleration in the core inflation requires the Monetary Board to tighten its policy to avert a future crisis. 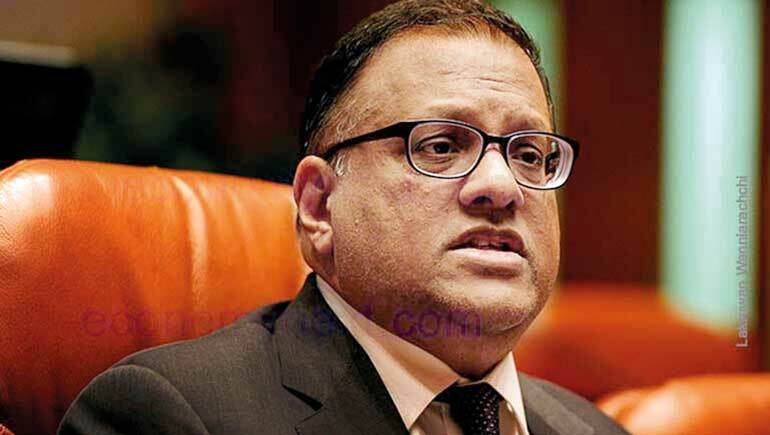 On the external front, the Board has focussed on temporary relief gained by Sri Lanka in January 2016, though the ailment had been hitting the country head-on quite for some time. Anyone who reads the Board’s review will not think that the country is in a real external sector crisis. Quite contrary to the assurances of the Board, foreign exchange inflows to the country through exports and remittances have declined, while outflows on account of the repayment of foreign loans and foreign investors quitting the government securities market have increased. The trade deficit, manifesting a serious structural problem faced by the country, has increased marginally from $ 8.3 billion in 2014 to $ 8.4 billion in 2015. This has been the level of Sri Lanka’s trade deficit over the past few years. But, the Board, ignoring this long-term malaise, has taken solace in the narrowing of the deficit in January 2016, presumably assuming that it would be continued forever. However, the Board has disputed its own logic when it has admitted that in the first two months of 2016 alone, reserves have fallen from $ 7.3 billion at end 2015 to $ 6.6 billion at end February 2016. The review has presented a picture of worsening money supply and credit growth in the recent past. But, the Board has expressed the expectation that the market will correct the situation by itself in the period to come. This is where the Monetary Board has failed. It is like a physician, having noted that the condition of the patient has worsened on all counts, refraining himself from administering the needed medication expecting a paranormal power to cure the patient. Despite the alarming macroeconomic picture, the Board has chosen to keep its main interest rates and the statutory reserve ratio unchanged from the previous month. This decision of the Board does not go with the accepted economic laws. What are these main interest rates? One is the Standing Deposit Facility Rate or SDFR that remains unchanged at 6.5% per annum. The other is the Standing Lending Facility Rate or SLFR fixed at 8% per annum. SDFR is a peculiar animal. It is being used by the Central Bank to get commercial banks to deposit the excess liquidity which it has already created by lending the Government or by buying foreign exchange in the market or by both. Commercial banks, instead of lending to customers, would keep such money in deposit with the central bank. SLFR is the opposite. It is being used by the Central Bank to supply new money to commercial banks when they are faced with a liquidity shortage. The main reason for the occurrence of such a shortage, as is the case today, is the net outflow of funds from the country on account of imports, foreign loan repayments or the Central Bank’s sale of dollars in the market to maintain the exchange rate at the prevailing levels. According to market reports, there is a liquidity shortage in the financial system at present prompting commercial banks to borrow from the central bank under SLFR system. Normally, when there is a liquidity shortage, there is pressure for the market interest rates to go up. But when funds are available under SLFR system at 8% per annum, such pressure would be eased by the new money created and supplied by the Central Bank to commercial banks. However, if the shortage is large enough, the market interest rates will move up significantly above the Central Bank’s SLFR enabling some banks to borrow from the central bank and lend to banks in deficit. This practice is known in financial markets as ‘arbitraging’ – making profits by buying from low priced markets and selling at high priced markets. Arbitraging by itself is not a bad practice. It allows markets to eliminate shortages in some markets by moving goods from markets with surpluses. Therefore, it is an accepted process for markets to reach their equilibrium – a condition without shortages or surpluses. However, the arbitraging opportunities created by the Monetary Board by keeping interest rates low when the markets aspire to have high market clearing rates will result in a continuation of the market disequilibrium. The Central Bank will have to pump money continuously to the market without ever reaching the equilibrium level. In the process, it gives wrong signals to banks that they could make profits out of Monetary Board’s anomalous monetary policy without lending to customers. These low interest rate regimes have unintended repercussions for sustained economic growth, exchange rate stability and future inflation. The Monetary Board appears to be under the impression that low interest rates would stimulate the economy and expand the output, employment and prosperity. The rationale behind this belief is that low interest rates would increase both consumption and investments thereby expanding the total demand in the economy. Such an increase in the total demand will incentivise suppliers to increase output by hiring more labour and utilising more resources. It would automatically bring about economic growth, it has been argued. But this claim has been refuted by the Austrian-American economist Ludwig von Mises his 1912 book titled ‘The Theory of Money and Credit’. Mises argues that in economies which are open for international trade, low interest rate policies help “friends of those in power to make money out of cheap credit” and lead to depreciation of the currency through increased imports leading to worsened balance of payments. This is evident from the experiences of Sri Lanka in the past five- to six-year period. Sri Lanka had had a low interest rate regime during this period but economic growth, instead of accelerating, continued to decelerate from 2012 onwards with pressure exerted for the rupee to depreciate. Economic growth fell from 9.1% in 2012 to 4.8% in 2015. The rupee is at all-time low today. There is another reason for the non-working of low interest rate strategies. The Monetary Board expects its low interest rates to be translated into low deposit and lending rates in commercial banks. But when the Monetary Board cuts interest rates, banks normally reduce their deposit rates immediately but continue to keep the lending rates at a higher level. There are two unintended consequences of this abnormal market development. On one side, savers who get discouraged by low rates resort to consume more imported goods. That will reduce domestic savings more. On the other, banks, keeping high interest margins will make high profits. This is evident from the examination of the financial results of the six largest domestic banks and the two biggest foreign banks for 2015. The average deposit rate of these eight banks amounted to 4.9%, while the average lending rate stood at 12.4%. In the meantime, these eight banks had made a staggering before the tax profit of Rs. 107 billion. Hence, the low interest rates have simply enabled banks to make bigger profits and not to stimulate the economy as expected. Another unintended consequence of low interest rates is the pressure it would make for the exchange rate to depreciate. The Monetary Board has tried very hard to keep the exchange rate against the US dollar at around Rs. 143 per dollar. It has used an unorthodox method of dictating a spot rate to commercial banks. But, the markets which are smarter than the bank have manifested the pressure for the exchange rate to depreciate through movements in 1-week forward rates. In that market, the rupee has depreciated to around Rs. 147 per US dollar, which is not explained by the interest rate differential between Sri Lanka rupee and the US dollar for one week (Visit: http://www.investing.com/currencies/usd-lkr-forward-rates). The danger of this development is that the Monetary Board is following the market, and not leading, with respect to both the interest rate and the exchange rate. When the market rates move pretty much above the levels desired by the Board, it has to make a series of mistakes to keep the rates at the desired levels. To keep low interest rates, it has to keep on printing more money but it would threaten future price stability. To defend the exchange rate, it has to keep on intervening in the market by losing its foreign exchange reserves. Sooner or later, like in Thailand in 1997, the Board will come to a situation where it no longer has foreign exchange to support the exchange rate. At that stage, it is inevitable that the rupee will have a free-fall. In the recent past, the central bank, presumably with the approval of the Monetary Board, tried to suppress the interest rates in the market by rejecting all the bids at successive Treasury bill and bond auctions. But this is not a strategy which the bank can follow continuously since it requires the bank to compromise its monetary policy by financing the government through newly printed money. Hence, on occasions, it has to allow the auctions to determine the rates as well as the quantum of funds to be raised. In those auctions, rates invariably go up forcing the bank to sell bonds below their face value causing a loss to the government. In a recent such auction, as reported by the financial website ‘EconomyNext’ (available at: http://www.economynext.com/Sri_Lanka_long_bond_yields_plunge-3-4641-3.html), a 15-year bond carrying a fixed rate of 11% and maturing in 2030 has been sold at a rate of 14.23% or below its face value. Within three days, the yield rates pertaining to these bonds, according to the web, have plunged by about 2%, increasing their market prices significantly. It has allowed the original bond investors to earn a massive capital gain which could have been earned by the Treasury had the bonds in question been issued at the prevailing secondary market yields. According to the Web under reference, the decline in the rates in this manner would facilitate the original investors to cash in Rs. 78 million by way of capital gains for each Rs. 1 billion worth of bonds they hold. This transaction with sudden declines in rates, it appears, is suggestive of another Treasury bond scam now rubbing on the face of the Monetary Board. The experiences in other countries show that, even after many years, such scandalous transactions can be reopened for public scrutiny. This makes it necessary for Board members to exercise utmost due diligence when assessing such transactions. It appears that the Monetary Board is now in a dilemma in its monetary policymaking. ‘The Devil’s Alternative’ was the title of the bestselling novel of the British writer Frederick Forsyth. He had used this phrase to describe the critical situation which one faces when, whatever the choice he makes, he ends up in disaster. It appears that, with respect to monetary policy, the Monetary Board too is caught up in a devil’s alternative today. That is, without ending up in disaster, it cannot either continue with the current loose monetary policy or tighten it as required by emerging macroeconomic conditions.